List of AGOA-eligible countries, date of eligibility, and status of compliance with AGOA's 'Wearing Apparel' and Category 9 "traditional and folklore fabric" provisions. 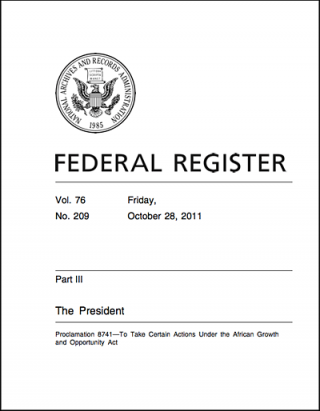 AGOA eligibility requirements are set out in Section 104 of the AGOA legislation (Public Law 106/200). 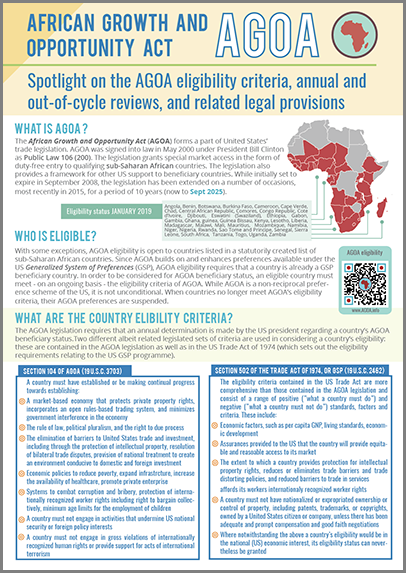 Only Sub-Saharan African countries are considered for eligibility, and with AGOA beneficiary status having been awarded to approximately 40 countries (this number changes from time to time). While the eligibility requirements are set out in the legislation, it is the United States which determines, annually, whether countries have met the published eligibility requirements. Beneficiary status may therefore be granted, or withdrawn, at the discretion of the US President. Beneficiary countries have no recourse to dispute settlement in this regard, and this unpredictability is one aspect that differentiates AGOA’s non-reciprocal preferences to those contained in reciprocal and bilateral trade agreements. On October 2, 2000, former US President Bill Clinton designated 34 Sub-Saharan African countries as eligible for the trade benefits provided under AGOA. Shortly afterwards, on January 18, 2001, Swaziland was designated as the 35th AGOA eligible country and on May 16, 2002 the Ivory Coast (Côte d'Ivoire) was designated as the 36th AGOA eligible country (the Ivory Coast subsequently lost, and later regained beneficiary status). The Gambia was declared eligible on January 1, 2003, while the inclusion of the Democratic Republic of Congo (DRC) was subsequently backdated to January 1, 2003 (the DRC has since lost its status). On 31 December 2003, the Central African Republic (CAR) and Eritrea were removed as AGOA-beneficiaries (Central African Republic was reinstated on 15 December 2016), followed later by Mali and Madagascar, while Angola was included. Other additions to this list are Burkina Faso and Burundi, while Mauritania has been suspended. In December 2006, the Republic of Liberia was also added. Countries not eligible for AGOA are Zimbabwe and Sudan, although South Sudan had since been granted beneficiary status, but has lost it again from 2015 onwards, as did The Gambia. Guinea Bissau regained eligibility, as did Madagascar earlier in 2014. Swaziland has also been suspended from AGOA preferences, applicable from 2015. On 30 September 2015, Seychelles was graduated out of AGOA effective 1 January 2017 due to the country gaining developed country status. The linked table above contains the list of AGOA-beneficiaries. (3) does not engage in gross violations of internationally recognised human rights or provide support for acts of international terrorism and cooperates in international efforts to eliminate human rights violations and terrorist activities. 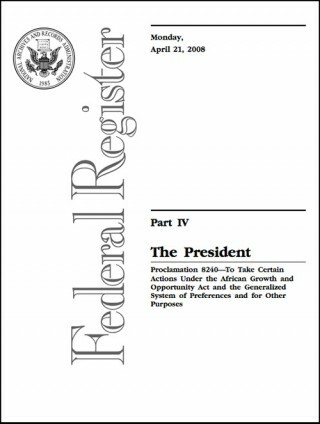 If the President determines that an eligible Sub-Saharan African country is not making continual progress in meeting the requirements described in subsection (a)(1), the President shall terminate the designation of the country made pursuant to subsection (a). Note* : Proclamation 7350 delegated to the United States Trade Representative (USTR) the authority to determine whether these countries have met the two requirements described above.